This morning ARM is taking the wraps off another new product in their Mali graphics portfolio: the ARM-Cetus. The oddly named product is the company’s latest generation display processor, designed for use in conjunction with ARM GPUs and other bits of Mali IP, and succeeding earlier products like the Mali-DP550 and Mali-DP650. 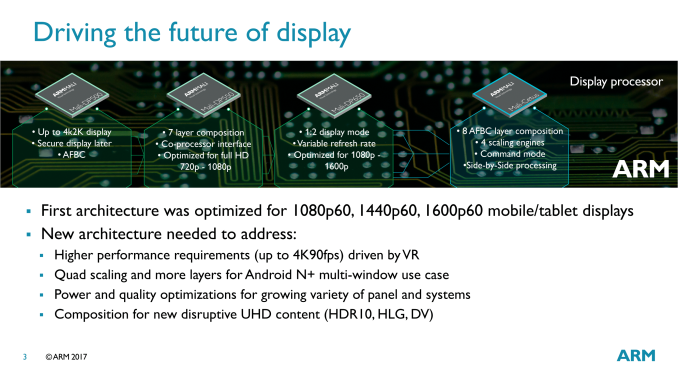 ARM’s display processors don’t tend to attract much attention, as they’re a fairly slow-moving, low-key part of the larger display pipeline. The flip side of that is that on those occasions where ARM does make a significant technological change, it’s definitely worth noting. 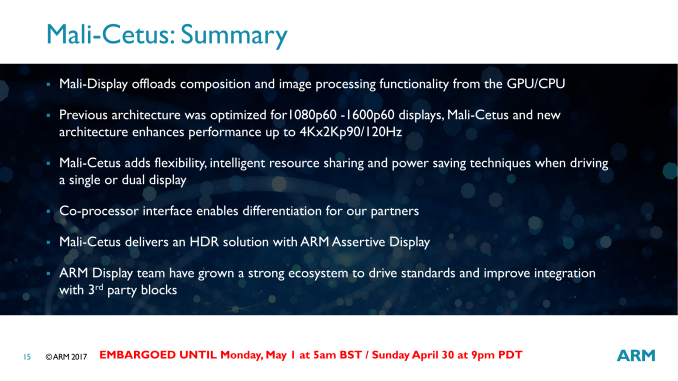 And in the case of the Mali-Cetus, that is very much the case as the company is rolling out a brand-new display processor architecture. The previous Mali-DP500/550/650 display processors were all based on a common architecture, with ARM iterating on it over the years. Cetus, on the other hand, is making a clean break, something we don’t see very often in this space. 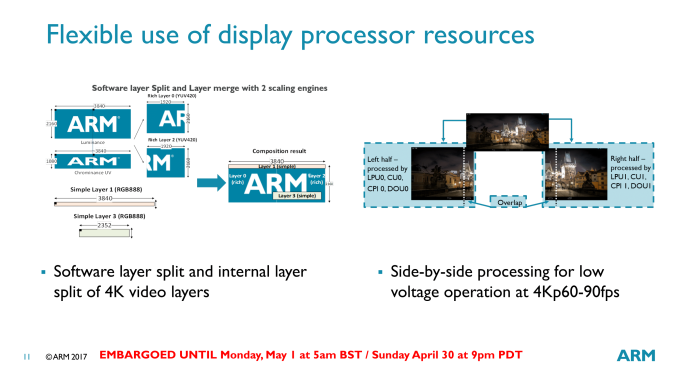 ARM is doing this in order to assemble a more modern design that can incorporate features such as HDR output and high throughput modes for VR, which were not a part of the earlier display processor family. Similarly, while previous generation processors could handle 4K, they weren’t especially efficient at it relative to lower resolution modes, as ARM was aiming a bit lower. The big feature additions enabled by Cetus can be broken down to improved layering and scaling, higher performance for VR, further power optimizations, and the ability to support newer transport standards such as HDR10 and Hybrid Log-Gamma. Each of these in turn is meant to address a specific market, such as smartphones/tablets, VR headsets, and TVs/STBs. As part of the new architecture, ARM is offering a bit more detail on the technical underpinnings of the architecture. At the same time, they’ve also changed how their processors are logically designed/broken down so that they are broken up into 5 different units: the ARM FrameBuffer Compression (AFBC) Unit, the Global Control Unit, the Layer Processing Unit, the Composition Unit, and the Display Output Unit. Each one, in turn, handles a specific type of display processing task. The Layer Processing Unit is arguably the head of the display pipeline – especially since it contains the memory interface and buffers. It and the AFBC unit do most of the heavy lifting when it comes to memory-intensive operations, such as simple, orthogonal rotations of display layers. However from a practical perspective, the composition unit is likely where most users will see or feel the real differences. 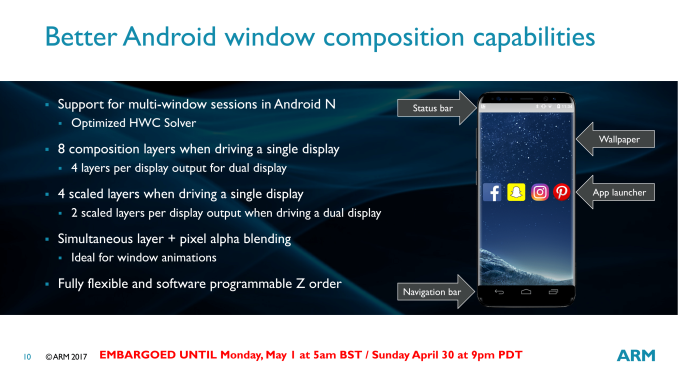 Responsible for compositing and scaling the different layers within a UI, ARM has consistently been buffing up their composition capabilities over the years to handle Android’s increasingly complex UI and features. 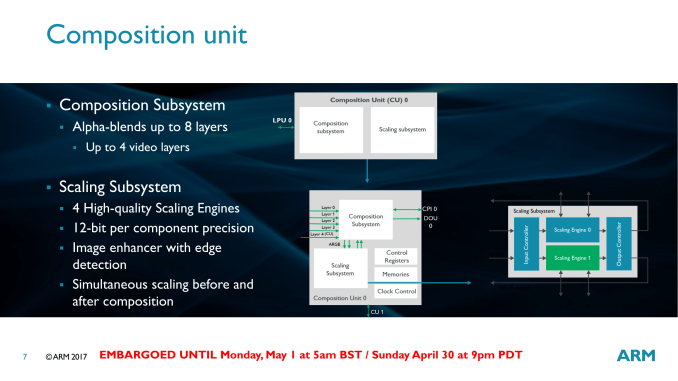 The Cetus display processor can now composite 8 layers – up from 7 on the previous-generation processors – and with 4 scaling engines, can scale up to 4 of those layers. This is especially significant for Android 7, which introduced multiple/side-by-side window modes, and each of which requires its own layer. Combined with any special layering effects on a given window (e.g. window animations), and a multi-window setup can easily eat up layers, not to mention pixels as well in the case of a high resolution tablet. Meanwhile Cetus as a whole has learned a few tricks to further improve power efficiency. One especially interesting trick is spitting up large (4K) layers into multiple smaller layers. 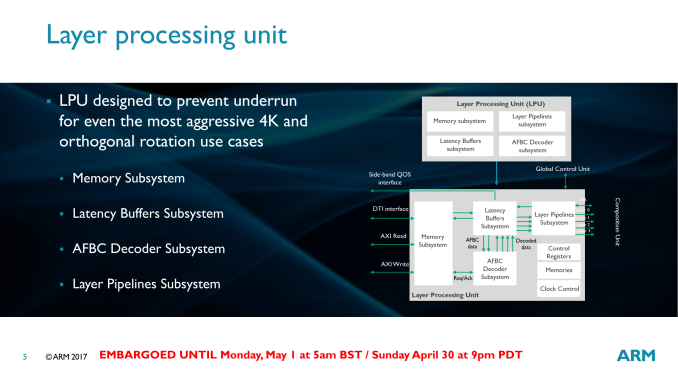 Since Cetus contains multiple sub-units for processing multiple layers, this allows one large layer to be distributed over more hardware. The net result is that rather than having to clock up the chip and burn more power to process a large layer, the processor can go wide instead and stay lower clocked by spreading the work out, keeping down total power consumption. Finally, new to Cetus is an interface ARM is calling the coprocessor interface. ARM is primarily pitching it as a means for its customers to differentiate from one-another by using their choice of coprocessor. Over time the interface can potentially support a number of coprocessor blocks (including 3rd party blocks), but for now ARM is launching with a block of their own: the Assertive Display block. Another product of last year’s Apical acquisition, the Assertive Display block is the company’s dedicated unit for tone-mapping, which is a critical part of mapping HDR image data to today’s (and tomorrow’s) SDR displays. 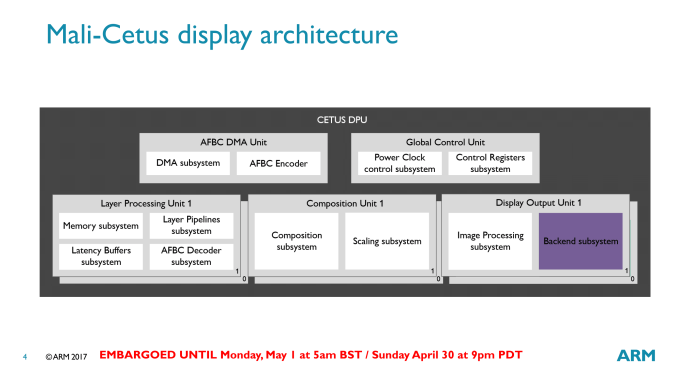 In turn, the combination of Cetus and the Assertive Display block makes the combined product ARM’s first HDR-capable display processor solution. 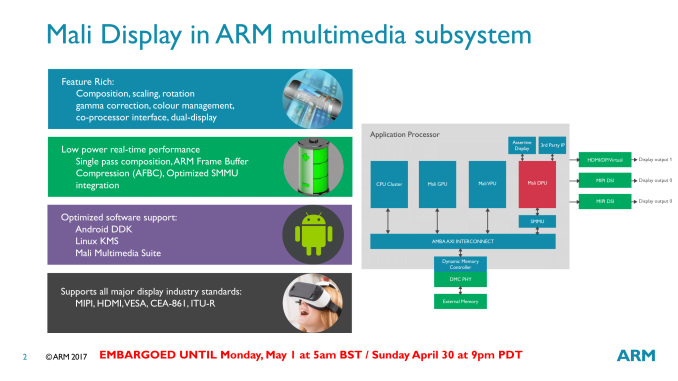 Wrapping things up, while it will take some amount of time for ARM’s new display processor to trickle down into SoCs and then finally consumer products, it should help them remain competitive in the display processor market. Besides improving their overall performance and energy efficiency, the specific features of the Mali-Cetus will enable ARM to finally supply display processor designs for VR headsets and 4K HDR TVs. The former is always an interesting market – one that is poised for rapid growth if it can find its killer app – while the addition of 4K HDR support will help ARM maintain and expand their footing in the very productive (and profitable) smart TV market, one that they have had a majority presence in for a number of years, and one where that trend is expected to continue.